To follow this blog, enter your email address in the box below. 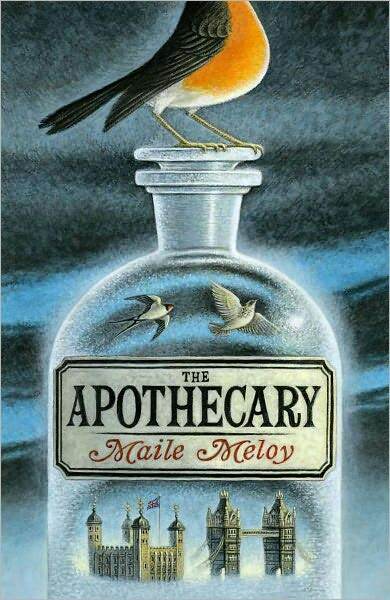 Fast-paced, intriguing, and emotional, The Apothecary had me spellbound the moment I picked it up from a bookstore’s bargain pile and laid eyes on its jacket art. When I saw the price tag said 100 pesos (around USD 2.25), I just knew it was meant to be. It would not disappoint. Break my heart, it would, in the ways good stories sometimes do. But fall below my expectations, it certainly did not. I read this introduction, and I could almost hear the slow writing rhythm of 70-something Jane. It provides not only a good hook, but also a stark contrast to the mad pace of the adventure to come (or the adventure that was)—the magical adventure of 14-year old Janie, plucked from sunny Los Angeles and dropped into dreary, post-World War II London, where, on the very same day of her arrival, she meets the titular apothecary. This barely-even-begun beginning gives just a taste of what will be an action-packed three weeks of Janie’s life. Soon, Janie and new-found friend Benjamin get sucked into a world of alchemy, murder, spying, and world politics. I know. World politics. This book, apart from being a definitely enjoyable and exciting piece of literature for young adults, also succeeds in encouraging discourse and piquing interest on The Cold War and the use/development of nuclear weapons. With a distinctly hopeful—some would say overly and naively idealistic—voice, The Apothecary offers an ambiguous look at the Capitalism vs Communism issue, with good guys and bad guys at either end. When discussed like this, it must all seem particularly yawn-inducing. Thankfully, it isn’t. This story is equally heart-stopping and profound, because even with such a bleak issue at its core, it maintains its balance with bigger-than-life characters. There’s your pickpocketing lock-picking Pip, who always knows the way out of a jam; Jin Ho, a calm chemist with killer kung fu moves; a dreamy villain with a scarred sidekick. The leads Janie and Benjamin, with their normalcy, act as surrogates (much like The Doctor’s companions) through which readers can anchor their disbelief and its suspension. I thought this was a one-off, but I see now that a sequel has just been released. I don’t know how I feel about that, because this story already feels concluded. In truth, I was thinking that it was quite refreshing to read a one-off YA novel, because The Apothecary showcases my arguments against planning a series, which can force a perfectly capable author to stretch a positively decent plot and turn it into three (or more) bland books with a thinly-spread story arc. I don’t think this book could have done as much as it did, with as much restraint as it had, if it had not been planned as a one-off. (And reading from the author’s Acknowledgements, I think it probably was.) One could almost mark the plot parts here: exposition, inciting incident, conflict, climax, denouement. And it is not a bad thing. Because once I got to that denouement, even though I already knew what was going to happen, it succeeded in three aspects: (1) it affected me, quite emotionally; (2) it easily fell into one of my favorite ending categories, of fates worse than death; and (3) it was completely justified. From that introduction of present-day Jane, we know that it doesn’t really have such a bad ending. But the book also asks us to put the story in the context of the world’s current armed conflicts, so it may have been painting a pretty bleak future for us after all. Then again, it tells us that there are people out there, unknown to us, who are secretly risking their lives for world peace. I can easily do as the cynical Benjamin does and say, “Now that’s just silly.” Or, I can choose to do as the book implores, and know that one must allow for the possibilities.